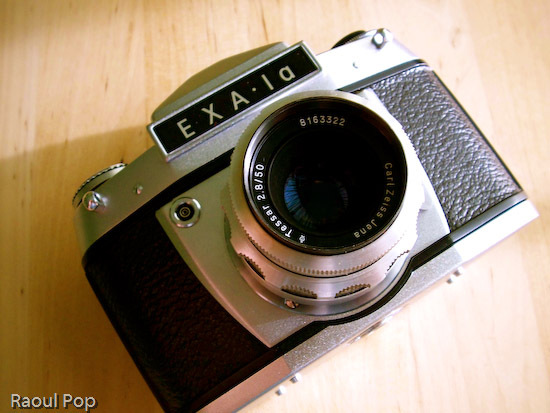 I got a fantastic present for Christmas from close friends of ours: an Ihagee Exakta EXA Ia analog camera. It apparently sat unused in a shop in Mexico since its factory production days back in the late 60s, still in the original box, waiting for someone to purchase it. It came with a whole kit which included a plastic/leather camera case, camera, lens, lens extension kit (for macro shots), two prisms/viewfinders (one normal, one 90-degree), a mechanical timer, a light meter and a ton of lens filters. You can watch a video review below or here, or scroll past it to see the photos and read my review. DIN sensitivity from 12-30 and ASA from 50-800, including b&w negatives; the list goes as follows: 12, 15, 18, 21, 24, 27, 30 (DIN) and 50, 100, 200, 400, 800 (ASA/ISO), plus C and NC. If there’s one expression I could use to describe this camera, it’s ease of use. Once I figured out the controls, it turned out to be a joy to play with them. The focus control is so well made, that at close distances, it turns slower, allowing for some real precise focusing. The aperture adjustment clicks, letting me know when I’ve reached a proper setting. 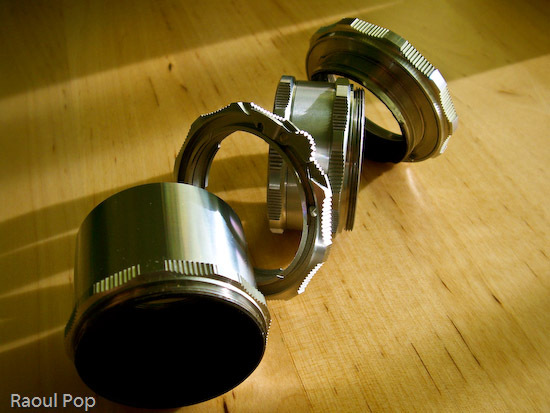 The film advancement lever’s travel is short and also clicks reassuringly. The exposure countdown dial clicks as well. I guess I like controls that click, but it’s the sort of feedback that encourages good use. It also gives the impression of something that’s very well-made. It’s quite easy to take the lens off, and I love the fact that the extension barrel breaks down into multiple sections. It lets me vary the focusing length and also changes the perceived aperture of the lens, allowing me to get closer or further away from the object. The interchangeable viewfinders are so much fun! I can just slide them out and use a different one, allowing me to customize the way I look at my photographic subjects. Both viewfinders allow me to see right through the lens (TTL), so I get a direct preview of the lighting conditions. When I adjust the aperture, the aperture ring closes or opens, and I can see right through the viewfinder how much light comes through the lens. Of course, as I found out with my first roll of film, you’d better know exactly what shutter speed you’re using, or else the photos aren’t going to come out as you saw them through the lens! Judging from the instruction manual, this camera could be had with some pretty cool accessories when it came out: a lens hood to reduce glare, a tele lens, and a Stereflex Jena viewfinder and lens, that took 3D shots. It could also use a vertical grip and electronic flash, powered by a strap-held, external Braun battery. Pretty nifty! Just goes to show that a great gift doesn’t have to be new! I need to point out (for those of you that have only used digital cameras) that working with a manual analog camera (especially one as old as this) is a _______ experience. It’s up to you to fill in that blank. Depending on your skill level and willingness to learn new things, it may be an amazing experience, or a completely frustrating one. 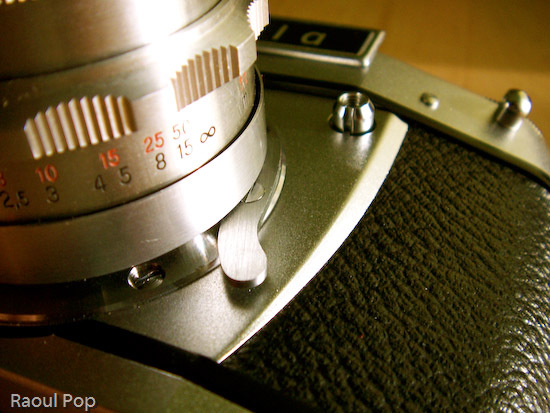 If you’re only used to point and shoot, there is no such thing on a manual camera. Instead, you have what you see below. 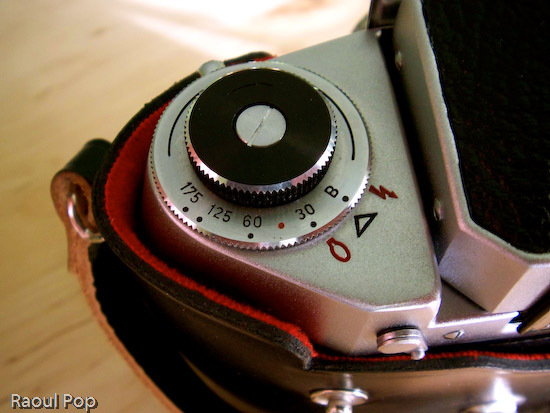 You have to manually adjust the camera settings like aperture and shutter speed based on ambient light. You can guesstimate and live with the results, or use a light meter like this one. If you enjoy using burst mode (where you can shoot 3 or more photos in rapid sequence), you can forget it about it. You have to manually advance the film by cranking on a lever after each photo. 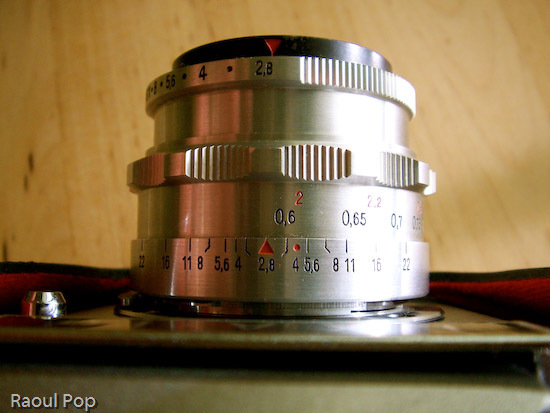 Autofocus? Forget about it! Auto-flash? No such thing. You’ll need to manually adjust the power of the flash/strobe based on GN (Guide Number) calculations. This may sound discouraging to novices, but believe me, it’s a fantastic learning experience. If you master the use of a manual analog camera, you’ll approach photography with a brand new perspective. The quality of your photos will improve tremendously, and you’ll get real joy out of using your camera, be it analog or digital. Plus, there are other fringe benefits, such as not needing to use batteries (manual cameras don’t need them) and of course, my favorite, the opportunity to pool with a really, really cool gadget. Once you hold one of these cameras in your hand and get to appreciate the fine engineering and craftmanship that went into making it, you’ll know you’ve got something pretty unique, something you don’t see these days, when cameras are made by robots. There’s something captivating about using metal levers and gears and getting real tactile feedback from your camera. I get a really nice feeling when I press the shutter and a mechanical part actually moves inside. It’s not a circuit, it’s not a sensor — it’s a real piece of metal. Now that’s nice! Updated 12/25/12: I no longer have the camera, please stop asking for the user manual. Thanks! Hello! 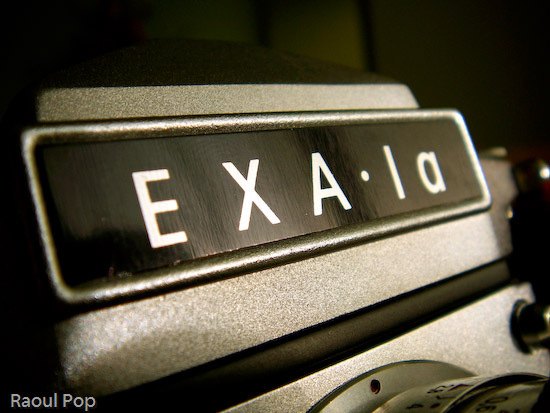 Just found one of these at an antique shop and was just wondering if you could email me the manual for the Exakta. Thanks!! Nope, don’t have the manual and also no longer have the camera. Reading your thorough article I was going to ask the same question as Marta, just bought one and I´m looking forward to start using it. This summer I bought a beautiful Wide lens Flektogon 4/25 and that´s how I became intersted. Did you ever work with that one? 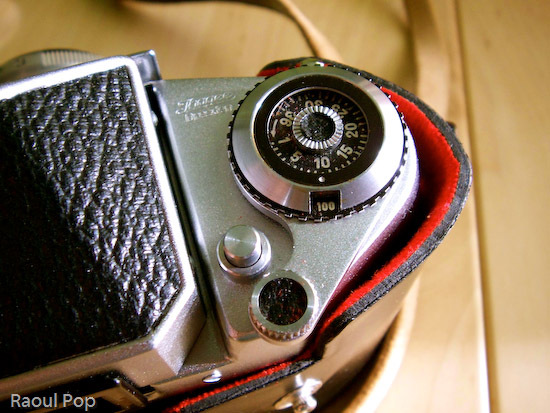 The one that bought your camera is very lucky, because it dated from the 60´s it is brand new! Would you be willing to send me the English manual by mail? Hi Rianne! Never worked with the Flektogon lens. I’ll see if I can find the English manual and email it to you. I can’t promise anything though, because it’s been a while since I downloaded it and I may not find it. could you send me the manual of this camera? thanks for the video, i’ve just got one! and i speak spanish, so it would be perfect for me. would u? 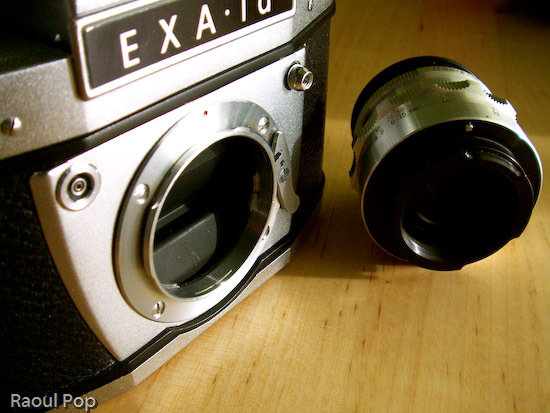 I no longer have the camera and hence the Spanish-language guide, but I do have a general English-language guide for Exakta cameras, so I’ll send that to you via email. 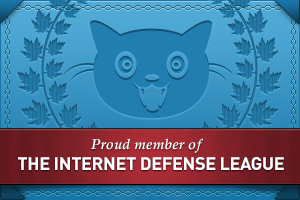 Tom, you might try the Exaktaphile or the Ihagee Exakta Enthusiasts email lists. I linked to them in comment #9, right above yours. Good luck. 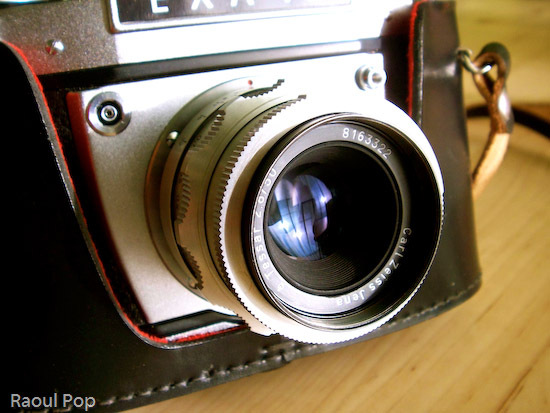 I have a Camara that looks identical to yours. I am not a camara buff and am in no way knowledgeable about photography. (Please don’t be offended!) I was trying to value my camara for sale and have no idea where to start. Can you help? 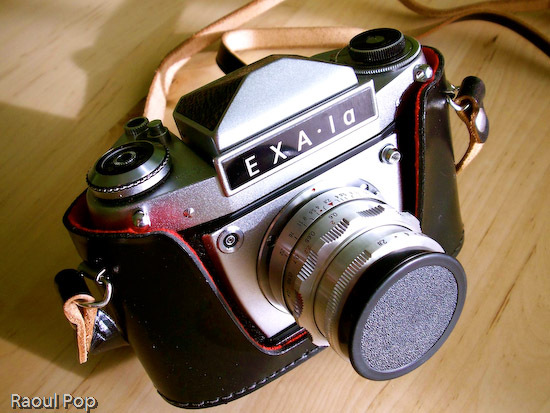 Bob, I’m not familiar with other Exakta cameras but my own. I really do wish I could help you but I’m not sure how yours might work. If it doesn’t work the same way as mine (and as demonstrated in the video), then it’s probably better to ask the experts. 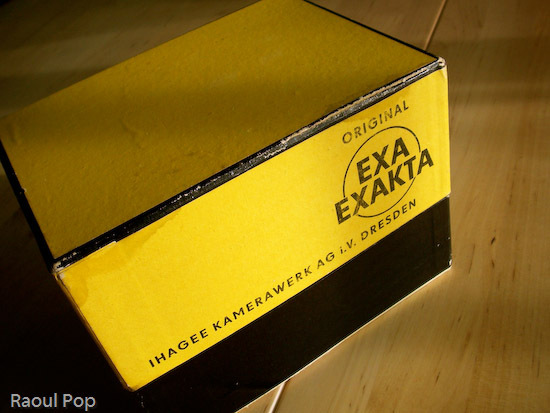 Have you tried Exaktaphile or the Ihagee Exakta Enthusiasts E-mail List? 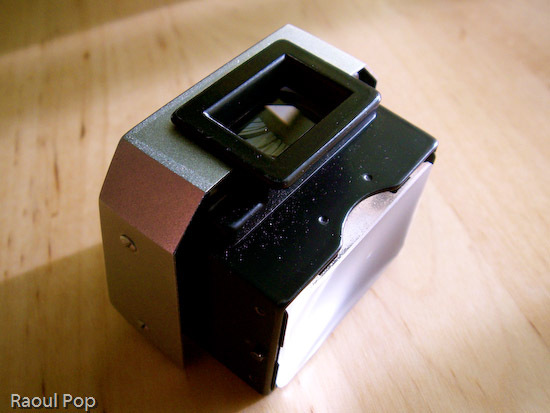 I have an Exacta camera and am having trouble figuring out how to rewind and unload the film, there are two knobs on the bottom of the camera, one only opens the back and the other just seems to spin freely – this is the knob I think should be used to rewind the film. Could you tell me how to retrieve the film from the camera? Raoul, some extra info re: the ISO sensitivity. It is even better: it’s not ISO, it is DIN and ASA! They correspond so that 18 DIN is 100ASA and 30 DIN is 800ASA. BTW ISO has the same value as ASA. Appreciate the correction, Bart! Will modify post accordingly. Thanks! 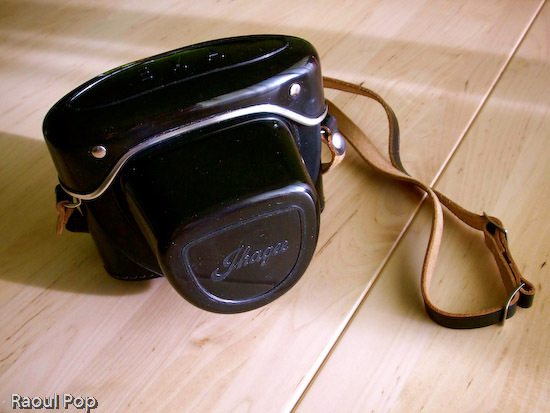 That was my very first SLR in 1974. 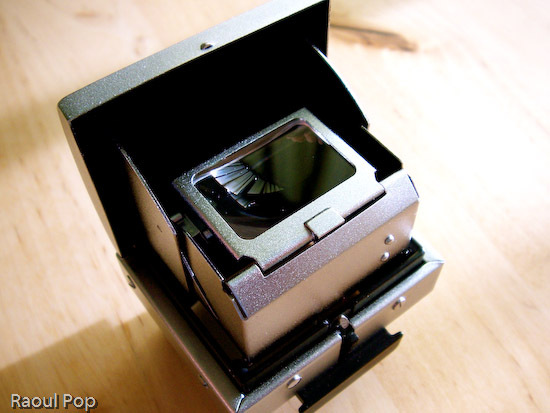 Though mine came with the waist-level viewfinder, and not the pentaprism. I shot a lot of slide film and some black and white with it until around 1980 or so. Low-tech, reliable, and not a good find. I sold it a long time ago, and bought some Exaktas in 2005 to play with. Thanks for sharing.